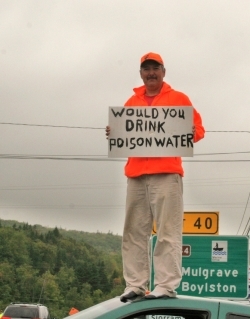 AULD'S COVE, NS—Upwards of 200 people, coming from all corners of Nova Scotia, responded to the imminent threat of exploratory oil and gas drilling on the shores of Lake Ainslie, and on September 22 staged an information picket outside the town of Auld's Cove. Protestors, in this case assisted by the RCMP, created a colourful gauntlet of signs, strings of prayer flags, song and dance, through which passing motorists were directed. The action auspiciously took place on Global Anti-Fracking Day. Despite the slow-down, motorists responded in an overwhelmingly positive manner to the action; thousands of pamphlets were distributed, and the afternoon resonated with the emphatic staccato of fists pumped to passing car horns. 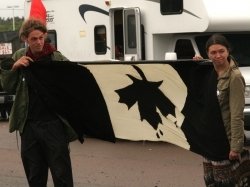 During the third hour of the action, in deference to a Mi'kmaq water ceremony to which all those in attendance were invited, the RCMP fully blockaded the highway—the only roadway on or off the island of Cape Breton—for about 20 minutes. The focus of the day's action, in a specific sense, was to protect Lake Ainslie, Nova Scotia's largest freshwater lake, from any and all fossil fuel drilling on her shores. Currently, the provincial government has only issued one exploratory well permit to Toronto-based company PetroWorth Resources Inc.; the company has promised no “fracing” [sic] will occur at the drill site. Most likely the word “fracing” is referring to the technique of hydraulic fracturing, the water-intensive and often environmentally damaging technique of drilling for fossil fuels. “Fracking,” the commonly accepted slang term for the technique, has left a path of chemical pollution, sunken water tables, earthquakes and displaced residents across North America. It is difficult to take PetroWorth, a company that has made its name fracking Western Canada and Nova Scotia's neighbouring province of New Brunswick, at its word, especially when that word appears to be knowingly misspelled. To Robert Parkins, closest neighbour to the potential drill site on the shores of Lake Ainslie, the question is one of semantics. Parkins views the positioning of the site, which has been selected by PetroWorth due to various 19th-century finds of oil and gas in the area, as an attempt by the province and the corporation to force a "worst case" scenario situation. Essentially, claims Parkins, if a drill site can be established on the shores of relatively pristine Lake Ainslie, the province's largest freshwater lake, at the head of the Margaree River Watershed and with some of the last remaining viable Atlantic salmon spawning grounds in the province, then it can be done anywhere. “It's one of the worst possible locations that you could ever put a drill site. So if they can get away with putting a drill site there, it's going to set a precedent in Nova Scotia that they can place them anywhere,” says Parkins. It would appear that protest actions, which have included a partial blockade of the same stretch of highway on September 14 and 15, are beginning to have an effect on local Mi'kmaq chiefs. Initially the chiefs appeared to sign off on PetroWorth's exploratory well permit, after being consulted by the provincial government. But the recent unrest, coupled with the effort of a group of local Mi'kmaq organizers who forced their way into a meeting of the Assembly of Nova Scotia Mi'kmaq Chiefs (ANSMC) on September 20, has caused the chiefs to do something of a public about-face. A press release, issued on September 21, notes that the ANSMC are “in support of the community's concerns on hydraulic fracturing in the Lake Ainslie area of Cape Breton.” The press release, while cause for some degree of hope, does not demand that PetroWorth's exploratory well permit be rescinded. Nor is it certain that the ANSMC would have to ability, without entering into the legal sphere, to literally change its stance mid-stream on the permit issuance. Wilbert Marshall, chief of Chapel Island, was the only Mi'kmaq chief to attend the September 22 action. Judging from his response and the escalating public display of Mi'kmaq disapproval, it would appear that the ANSMC may soon be faced with that exact dilemma. Despite the presence of concerned citizens from all walks of life, noticeably absent from the day's action was the mainstream media. It would appear that perhaps PetroWorth, and the provincial NDP government, may well have bitten off more than they can chew in attempting to drill for oil and gas in Cape Breton. Since being taken to court earlier in the year, albeit unsuccessfully, by the Margaree Environmental Association, PetroWorth has seen its stock value nosedive from a November 2011 high of eight cents per share down to a current value as of press time of two cents per share. Resistance to oil and gas drilling in Cape Breton, if the weekend's demonstration are any indication, is riding a surge of energy, and organizers are already talking of following Quebec's recent provincial moratorium on fracking. Miles Howe is an editor with The Dominion and a member of the Halifax Media Co-op, where this article was originally published.